In Western countries, when the time comes to decorate the streets with strings of sparkling lights, it’s a sure sign that Christmas is drawing near. But for countries like Japan, where Christianity has far less presence, though the desire to adopt Western practices is pervasive, what many of us think of as “Christmas lights” or simply “holiday lights” are embraced as annual “winter illuminations.” Every year, parks and town districts across Japan light up the night with large-scale displays, bringing a new sense of beauty to the barren, winter landscape. The greatest of these is undoubtedly Nabana no Sato, located in Mie Prefecture. This year the theme of the decorations is “a celebration of Mt. Fuji as a World Heritage Site.” For those who haven’t heard, Japan’s most famous mountain was recognized as a World Heritage site by UNESCO in June of this year, and in acknowledgement of this achievement, Nabana no Sato has put together an unprecedented display of approximately 8.5 million twinkling lights! It may seem a bit early, but this winter wonderland is already accessible and will remain installed until March 31, 2014. ▼ Check out this aerial view of the park all lit up! The park contains many wonderful sites worth seeing. To fit this year’s theme, a model of the great Mt. Fuji has even been installed! This glistening mountain changes colors over the course of the night to represent sunrise over the summit, the moonlit mountain, cherry blossoms in bloom, and images from every other season and time of day. This installation is special for this year only and does well to capture the Japanese spirit. ▼ These particular variations represent sunrise, autumn, moonlight, and summer. ▼ And here’s the mountain in springtime with the cherry blossoms. Another of the park’s most popular fixtures is its flower-themed tunnel of lights. Here, approximately 1.2 million lights are used to create a 200m (656ft) long corridor. The mood is so romantic; it makes for the perfect date spot. Or, if flowers aren’t really your thing, there is a second corridor, only 100m in length, which is composed entirely of LED lights. Every year the color palate of these brightly lit corridors is different. Once the shorter path was bathed in gold and another time lit up with rainbows! 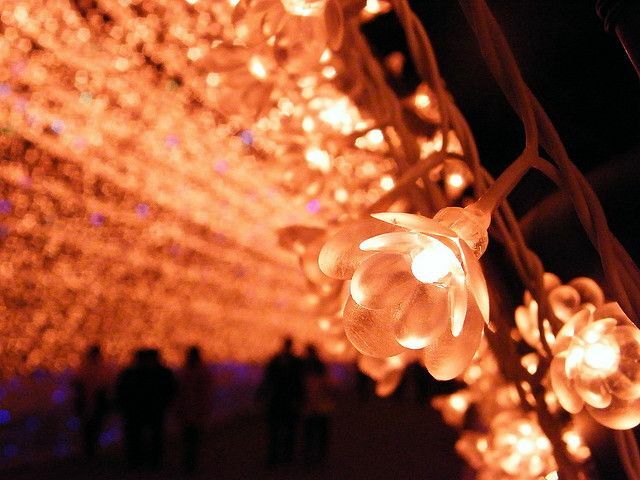 One must visit the illumination every year to experience both the great and subtle changes. Nabana no Sato’s other great claim to fame is its collection of lights floating above the water. As far as illuminations over water go, it is Japan’s largest, bathing the surface of the area’s long lake in beautiful light. And if that’s not enough, the park’s reflecting pool makes use of the still waters by shining bright lights on the trees by the bank, for as long as the fall colors linger. When the brilliance of the changing leaves is at its peak, they reflect most beautifully on the pond’s surface, bringing double the imagery to the already stunning atmosphere. Between all of these iconic items still sit fields of brightly lit bulbs. In order to see it all and to truly appreciate the big picture, you may need to take a ride on what’s called the “Island Fuji.” In the pictures it may look a bit like a UFO, but it’s actually a 360 degree observation deck, which allows the viewer an unbroken view of the entire park below. In short, whether you’re interested in experiencing a Japanese winter tradition, wishing for a hint of holiday spirit, or just looking for a romantic rendezvous, Nabana no Sato’s winter illumination is the perfect place. Its glowing lights are certain to warm your heart and brighten your spirits, even in the face of the most dreary winter chill. Illumination: approx. 5 to 9 P.M.